The 21-year-old spent four years with Arsenal before joining Brighton last summer. 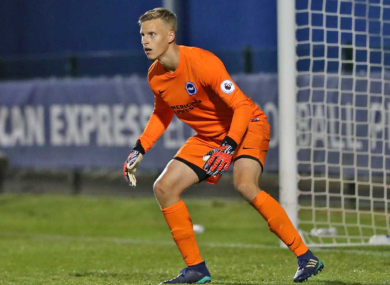 WATERFORD HAVE SECURED the services of Finland U21 international goalkeeper Hugo Keto from Premier League outfit Brighton on loan until this summer. Keto spent four years with Arsenal before moving to the AMEX at the end of last season, having initially moved to England from Finnish side HJK Helsinki in 2014. Waterford boss Alan Reynolds said that Keto’s signing would create healthy competition for the number one shirt at the RSC in the first half of the 2019 Premier Division campaign, which gets underway against Shamrock Rovers on Friday. “We’re delighted to get Hugo into the team. He trained with us this morning and didn’t look out of place,” Reynolds said. “It’s great to bring in another quality keeper and there’ll be great competition for the number one jersey now. Email “Waterford sign 21-year-old Finland goalkeeper on loan from Premier League Brighton”. Feedback on “Waterford sign 21-year-old Finland goalkeeper on loan from Premier League Brighton”.